It’s full swing summer here in Raincouver *cough* I mean Vancouver. We wait patiently for the sun to poke it’s head out in this city, but boy oh boy when it does it is so gorgeous round these parts! 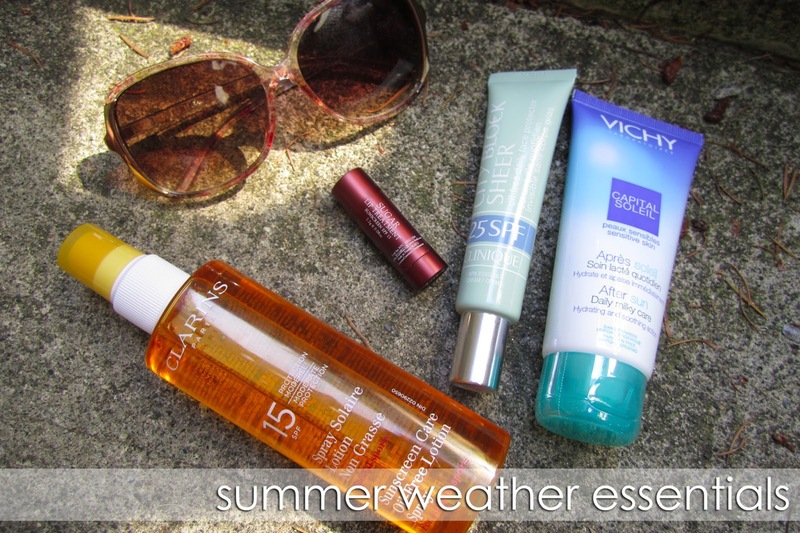 Of course every year when that yellow orb in the sky does make itself known, it has me reevaluating my summer weather must haves. First and foremost, a great pair of sunnies is non negotiable. I tend to stick to the more affordable brands simply because I am not keen on carrying a sunglasses case around with me. My current loves are from Aldo; I keep a pair in my purse and in the car, just make sure you get some that say they protect against UV rays – gotta protect those peepers! Lips are another thing I always keep SPF around for – ever burn your lips? I have and it’s the worst. I like to slather on the Fresh Sugar Lip Treatment, it smells like sugary lemons, tastes good and protects your pucker. 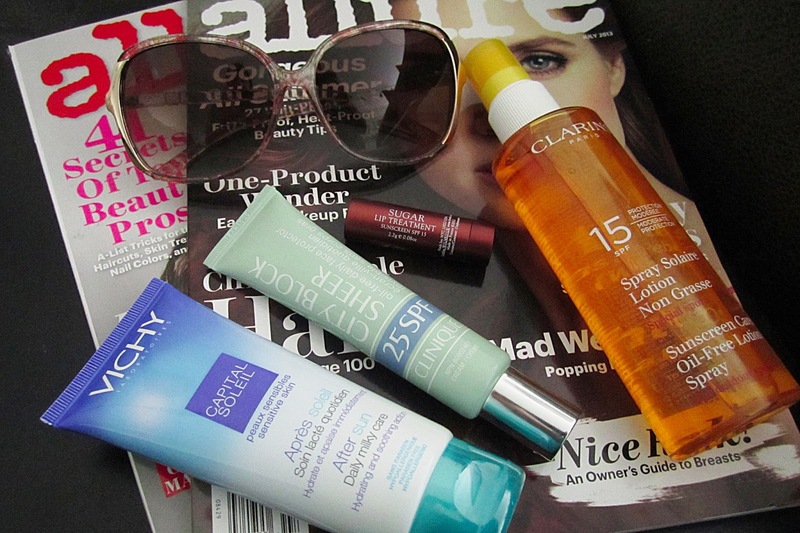 Summer Must Haves : Sunglasses, SPF lip balm, sunscreen for the face and body, as well as after sun lotion and favourite beauty reads for sun lounging! Face and body SPF are so important, I really can’t stress it enough. I know my teen years of sunbathing and SPF 4 tanning oil *shudder* will come back to bite me, which is why I protect myself daily now, sun shining or not. 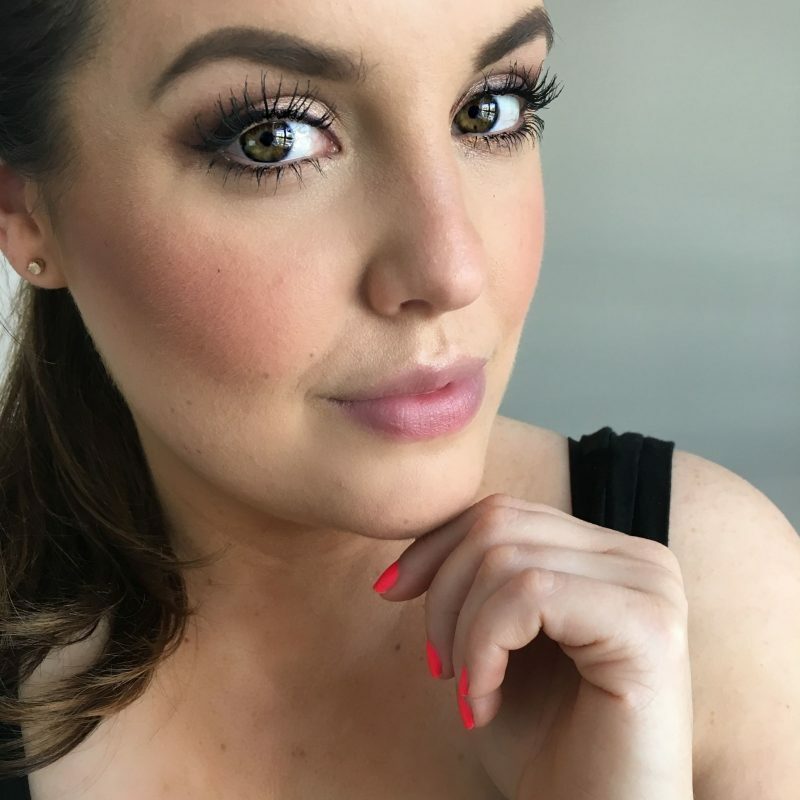 I am really loving the Clinique City Block Sheer SPF 25 for face right now, it makes my skin feel super smooth under my makeup, and never sticky or greasy (don’t forget your ears, they are quick burners!). It also protects your face from environmental pollutants, and comes in a 40 factor as well! On my body it is the Clarins Oil Free Lotion Spray, which comes in a 15 SPF here in Canada. Now, lets not fool ourselves – 15 is not enough for those days laying out in the sun, unless you want to reapply constantly. In that case I reach for a 30, but for my daily driving with the windows down, strolling in the sun and what have you, I use the 15 and love the way my skin feels wearing this. No grimy residue, it sinks right in and doesn’t leave that tell tale oily finish that sunscreen oil sprays would. It does have a fragrance to it, so if that sort of thing bothers you do try it out in the store before purchasing, I happen to like the smell. So lets say you did get some sun and a healthy dose of vitamin D, even if you didn’t burn you need to replenish your skins moisture, and for that I like the Vichy After Sun Daily Milky Care Lotion. It leaves my skin feeling moisturized and soothed! What are your favourite sunscreens? Have you ever had a really bad burn? Are you good about protecting yourself from UVB UVA rays?